How can a builder that produces distinctive, ultra modern boats have a name like “Wally Yachts”? Call me crazy but, to my mind “Wally Yachts” should be the name of a cartoon boat builder and not for such serious and stylish “yachts”. Wally’s are known for flush decks, ultra clean lines, and ultra modern styling (and function). 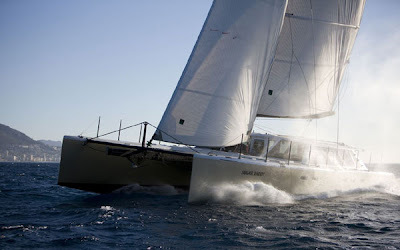 Even the huge and Wally 118 has just a single mainsheet line (powered by hydraulic muscle) that disappears below decks. The powerboats are straight out of James Bond. So, when the Wally Nano was introduced a while ago, I was fascinated. 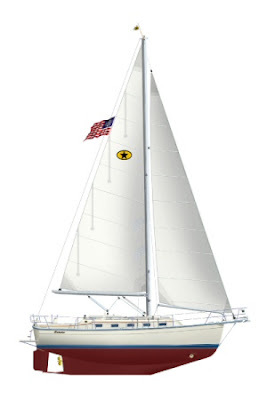 Surely, it’d be an ultra low slung “big daysailer” with all the pizazz of its Luca Brenta designed big sisters. The early profile drawings appeared decidedly more traditional than modern (especially the overhanging transom) and as the photos show, it’s a combination of ultra modern and traditional. And you can say what you want about a pink hull. But it sure is different. And with its 9 foot draft, carbon rig, and ample sail area horsepower, the Nano should have some get-up-and-go. And with every line and sheet controled by push button hydraulics, it should be ultra easy to sail (until you have a problem with the hydraulics, that is). Either way, if you can afford to buy a boat like this, chance are you’ll be able to afford any sort of maintenance it requires to keep up and running. Like a Lamborghini or a Ferrari these kind of boats are all about the “Wow” factor. Although the pink hull is kind of “cartoonish”. I hope to get over to Europe sometime this spring to take one (maybe a slick black one) for a test drive. Wow, how much for one of these?